A peek into post-processing after a photo shoot. Hello! I asked if you would like to see a photo editing post and there was some interest so here it is! A few FYIs before we begin: (1) I have only taken one photography course in my entire life and it was analog film in high school, (2) I am completely self-taught in digital photography, and (3) I am all about "the ends justify the means" so these might not be the recommended methods. Let's begin! Every person has a different photo aesthetic -- I don't believe there is a "right" way to create pictures. In general, I aim to create images that enhance and showcase natural beauty. First and foremost, I try to take a photograph that is good straight out of the camera. I shoot in full manual or aperture mode where I set the ISO, exposure compensation, focus, metering, and white balance. I always shoot in RAW -- this method creates digital files that retain ALL the data in an image which is optimal in post. STEP 1. ADJUSTING LIGHTS AND DARKS IN "BASIC"
On the left, I have the image as shot. It is not under or overexposed and the model is centered in my composition. I browse my images in Adobe Bridge and open it up with Camera RAW in Adobe Photoshop (just double-click if you use PS). I start on the Basic Menu. Believe it or not, you can enhance the colors in your image simply by adjusting the shadows and highlights. I typically bring down Shadows and Blacks while increasing Highlights and Whites. To increase the contrast a bit more, I will increase Clarity. I also increase the Vibrance in the image. 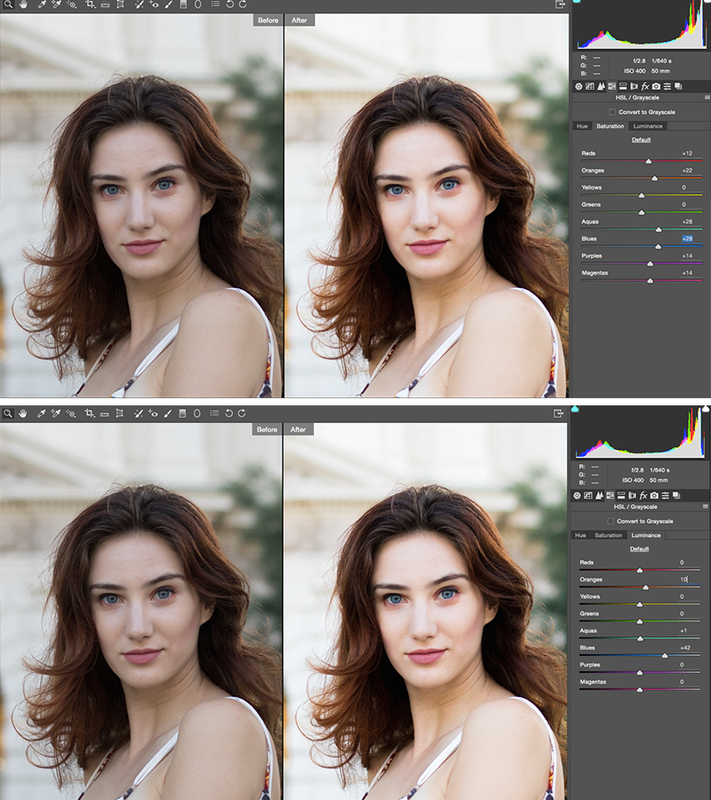 Saturation is increased, but always at less than half of Vibrance. I will also adjust the Temperature/Tint sometimes. 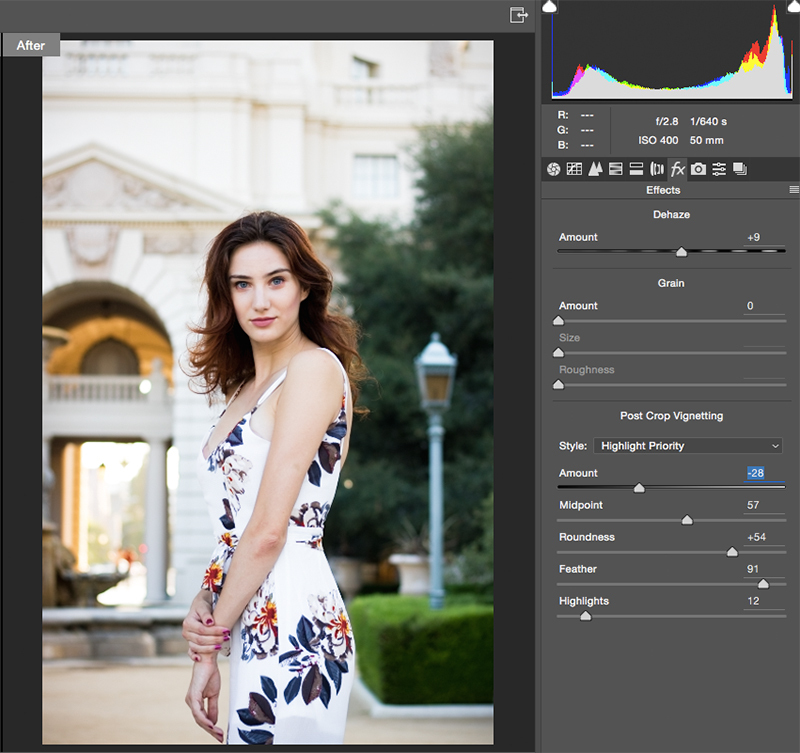 Exposure typically gets a slight increase because you know I love bright, airy images! STEP TWO: ENHANCING COLORS IN "HSL"
HSL stands for Hue/Saturation/Luminance which is the second menu I go to in Camera RAW. I like to enhance colors in my images, but not to an extent where it's not believable. For example, the model's hair is actually quite vibrant in real life, but was less so in the shadows. In this image, I've increased the saturation of Reds to make her hair more vibrant. I increased Oranges to bring warmth into her skin. I also increased Blues/Aquas to bring out the color of her eyes to how I remember them in real life. Purples and Magentas got slight boosts as well! The depth of colors can be adjusted by changing the Luminance. I increased the luminosity of the model's skin so that the orange wasn't as deep. The Blues were bumped up to +42 to bring more light into her eyes. Again, I'm making the edits as natural as possible. In this case, I did not adjust Hues. I know that at first glance, these two images look identical, but I promise they're not! STEP 3. EDITING IN "EFFECTS"
I don't add a whole lot of bells and whistles into my photos. My last alteration in Camera Raw is to Dehaze the image slightly and, occasionally, add a Vignette (darkens the edges of the photograph). I've been playing around with subtle vignettes on some of my photos recently. I think it's a nice way to draw focus into the more luminous center of the image. At this point, I'm typically done with tweaking in Camera Raw and I open the image into Photoshop. 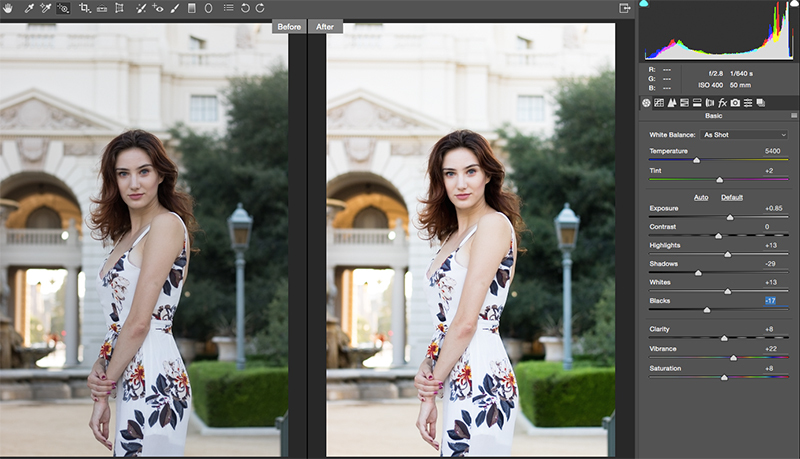 I crop the image to my liking and start retouching, which is the most time consuming part of the editing process. I use the Spot Healing Brush to smooth over blemishes and more extensive work to remove the bra that is showing under the model's clothing. I also start to Burn and Dodge. Burning darkens parts of the image and brings things into focus. It's useful if you have areas that might be slightly over exposed. Dodging is the exact opposite: it increases exposure. I like to do very light Burning on facial features, hairlines, and the jaw. The idea is to enhance the subject without making it the editing obvious. My motto is to leave no trace. 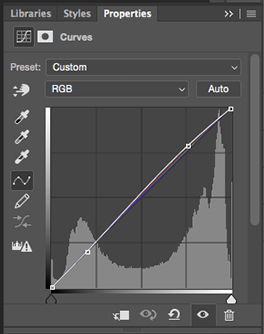 When I'm completely done with retouching, I sometimes add Adjustment Layers, such as Curves. I add in contrast by tweaking the shape of the curve: a prominent S will product a more visible effect. Like the other adjustments, I've keep changes very slight here to keep things natural. The goal is to enhance, not completely change and obliterate things in the picture. Now, I'm done! I typically resize the image for my usage purposes and save it. The final product you see the top of the post is what makes it to the Internet! Occasionally, I brighten it even more on platforms like Instagram because I love adding more light into images. I hope this was a useful post! Everybody has their own aesthetic and ideas so this is by no means the way you HAVE to photoedit. Let me know what you think and whether you're interested in more of these posts! I didn't realise that you used Camera Raw! It is always interesting to see how people edit their photos. Also because I feel there are so many ways to get a similar result but by different methods. Very interesting to read about your editing process, I can instantly tell your aesthetics when I see you pics on Insta! I was discussing photography with my brother yday and he was telling me the benefits of shooting RAW. This is quite similar to shooting film, I shoot in a 'flat neutral' profile and really get the footage to come alive through colour grading. A lot of work goes on behinds the scenes! It's that fine balance of making it look natural but also vibrant and bright. I only took a single photography course in high school as well! I really don't believe you need to take a ton of classes on the subject to become "good," because there is no "right" way, as you said. Manual mode is where it's at though. This was so interesting! You've inspired me to play around in Photoshop a little more. I think I'm going to do that sometime today! I never really adjust colors, but you've inspired me to learn. Please do write more posts like this you absolute genius, and have a great weekend! I am also into exploring photoshop to edit my photos. Great thing you've shared it to every body ;) Thanks a lot! YasssS I'm so happy you ended up posting this quick guide on editing pictures! With your years of experience, I can see how you're super pro now. I haven't really learned how to properly edit photos but I know I need to learn one of these days. I'm trying to start things off by at least taking some pics in raw format. Photoshop is such a powerful tool and you can do A LOT of magic with it! I can see the difference when you change the HSL settings of the image. I love the spot healing brush! It's a great life saver for temporary blemishes. I agree with your motto - leave no trace!! It kind of ruins the point of Photoshop if you leave the trace XD. Thanks for sharing, Alyse! so interesting, i always love seeing how people edit their photos! Goddamn, this some editorial looking shizz, I weep. But no seriously, I love seeing people's editing processes because there's always a few things you can learn and incorporate into your own work flow! (I mean, I learned about'clarity'(???) in this post alone) I don't shoot in RAW because of space issues, but I really should test the waters with it and see the potential difference it makes. I'm also a fan of adding vignetting--it's a great way to bring focus, add contrast, and set a certain mood to photos that need it! So, I actually looked at other tutorials and everyone seems to really enjoy Camera Raw! I wanna give it a shot but it seems way too professional for me xD Thank you for posting this tutorial, Alyse! Can't wait to put it to good use next time I edit photos. I love your edits! So interesting to see how other people edit since there's no single correct way! Also raw is *the* way to go!! Nothing wrong with being self-taught! I have a lot of respect for those who do that :D And you're right that there is no one way to do things, and we all have our preferences with the way we do things. These tips are useful, especially for those wanting to learn better photo editing skills. I may play around with these, but I generally just use the curve function to fix my lighting LOL I find that usually does what I need, and it's faster. Still, thanks for this tutorial! your article is truly illuminating a Picsart Photo editing Playlist commitment of gratefulness is everything considered to energize this new data. Your data truly helps absolutely for all. A devotion of appreciation is thoroughly to share.